Saint Gonsalo Garcia (1556-1597) is a Roman Catholic saint from India. Born in the western coastal town of Vasai, an exurb of the city of Bombay, he preached from the Bassein fort during the time the town was under Portuguese colonial rule. The feast of St. Garcia has traditionally been held on the first Sunday nearest to the neap tide following Christmas in Vasai. Gonsalo Garcia was born Gundi Slavus Garcia-- to a Portuguese father and a Canarese (resident of the Konkan coast) mother in Bassein, on February 5, 1557. He was the right hand of father St. Peter Baptist Superior of Franciscan mission in Japan. He was tutored by Fr. Sebastian Gonçalves, a Jesuit priest working in Vasai, in the college near Bassein fort. Garcia studied under the tutelage of the Jesuits for eight years from 1564 to 1572. Then, at the age of fifteen, Fr. Sebastian took Garcia to Japan. He soon managed to learn the language and since was seen as an affable person; he soon became popular in the local community as a catechist. He resigned and left to Alcao to set up trade. His business prospered and branches were opened in different locales in Southeast Asia. Gonsalo's long cherished dream to be a Jesuit did not materialise and moved on to Manila in the Philippines as a lay missionary. In the Philippines, he was influenced by a Franciscan priest, Fr. Peter Baptista and soon joined the Seraphic Order as a lay brother. After working with the leprosy patients there he was formally ordained as a Franciscan as the Friars Minor at Manila. On May 26, 1592, the Spanish governor in the Philippines sent Gonsalo on a diplomatic mission back to Japan along with Baptista. After working for four years, the Japanese shogun suspected the missionaries of sedition and were placed under house arrest in their monastery in Miaco (Kyoto) on 8 December 1596. A few days afterwards, when they were singing vespers, they were arrested, manacled and immured. 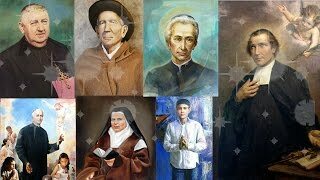 On January 3, 1597, the left ears of twenty-six confessors among them Garcia, were exscinded; but were then collected in reverence by the local Christians. On February 5, Garcia was crucified on Nagasaki Hills with twenty six of his companions. St. Garcia was the first to be extended on, and nailed to, the cross, which was then erected in the middle of those of his companions. Fr. Gonsalo, the first to arrive, went straight to one of the crosses and asked "Is this mine?". The reply was "It is not". Then he was taken to another cross, where he knelt down and embraced it. The others, one after another, started doing the same. "That was quite a sight, the way Br. Philip was embracing his cross. . . " comments one of the witnesses. Two lances impaled his body through his heart. While being nailed, Garcia sang praises of God, earning him the martyr's title.